Dr. Schlegel is a founding member of the Steadman Hawkins Clinic-Denver. In the fall of 2016, the clinic partnered with UC Health and the University of Colorado School of Medicine where Dr. Schlegel is an associate professor in the Department of Orthopedics. As the fellowship director for the sports medicine program, his practice focuses on the treatment of athletic disorders of the knee and shoulder. Dr. Schlegel is active with both basic science and clinical research. His work has led to the development of several innovative technologies including the Opus Medical device that has simplified arthroscopic shoulder surgery and a new biological solution to treat partial thickness rotator cuff tears using the patented Rotation Medical collagen scaffold. He has been recently named to lead the research team for the Hawkins Sports Medicine Chair that will emphasize injury prevention for sports performance programs in the young athlete. In addition, he is researching effective strategies for curbing soaring costs for healthcare delivery. Dr. Schlegel served as a team physician for the Denver Broncos for 18 years and in 2012 received the prestigious “Outstanding NFL Team Physician Award.” After graduating from Brown University in 1983, where he was an All-American water polo player, Dr. Schlegel received his medical degree from the University of Cincinnati. He completed his residency training in orthopedic surgery at the University of Utah, followed by a sports medicine fellowship at the Steadman Hawkins Clinic in Vail. Dr. Schlegel has been actively involved in the community, serving on several non-profit boards. 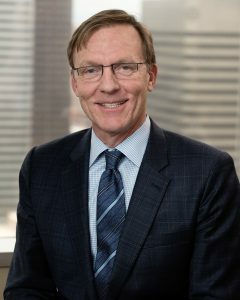 For the past three years he has been the Chair of the Boettcher Foundation Board and a trustee since 2006. His hobbies include family travel, fly-fishing and reading. Many of his travels have involved service activities, which he says significantly deepens the meaning of the trips.